Snow warnings have finally been cancelled! After five days, the snow has finally stopped falling on Jeju. This means that all the snow warnings issued across the island have been canceled. 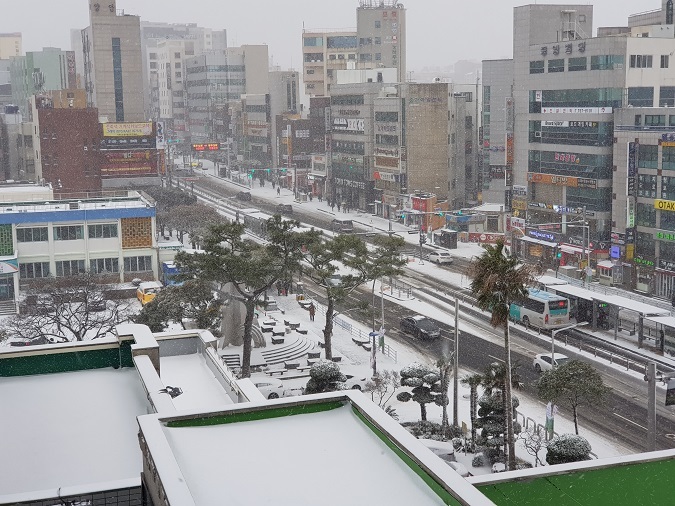 According to the Jeju Provincial Meteorological Administration on Feb. 07, the heavy snow warning, which was carried out at 4:30 a.m. on the eastern part and northern part of Jeju Island, were canceled at 8 a.m..
At present, the amount of snow that has fallen in Jeju City is 14.3cm, Ara-dong 52.1cm, Yusuam 25.7cm, and 22.5cm in Seongsan. The observation devices have broken down because of the huge amount of snowfall in Eorimok. 99.5cm of snow had fallen on Eotimok until yesterday daytime. All the trails are currently closed at Mt. Hallasan. While the snow warning has been canceled, there is still a lot of snow piled up on the street because of snow from the past five days. Also, the roads are still frozen and the road controls are still in force. At 9 a.m., the 1100 Road and 5.16 Road, the Bijarim Road, The First Sanrok Road and Myeongnim-ro were all closed. Also, vehicles must have tyres to go on the Beonyeong-ro and The Second Sanrok Road. The Meteorological Administration announced, "We are concerned about the damages caused by the weight of the snow that has fallen. In the meantime, we need to manage all facilities and ensure safe operation of the vehicle." The lowest temperature in the morning was between one and zero degree. The maximum daytime temperature will be between three to five degrees.